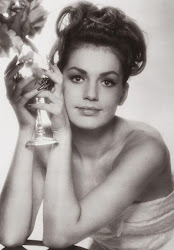 "It's Christmas, the season for giving; and the young beauty who calls herself Silvana (Catherine Spaak) has the spirit. 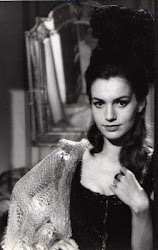 She enriches Christmas Eve by giving her favors to Count Adriano Silveri (Enrico Maria Salreno), brightens the day of her darling dentist, Arturo (Marc Michel), and then goes to the convent, where she was brought up...for her annual confession. 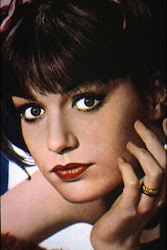 The truth is that it's always giving time for Silvana. She spends three days a week as the Count's mistress, and three with Arturo. She manages this deception by pretending to be an airline hostess, borrowing her roommate's name and flight schedules. The priest is horrified, but Silvana refuses to repent. She insists that she is giving her men equal time and equal love. 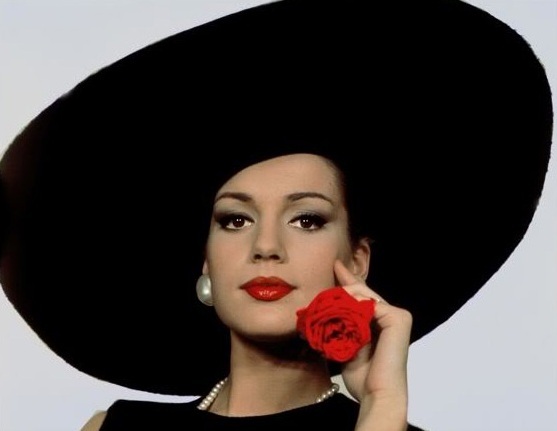 And she doesn't even mention Gianni (Manuel Miranda), whom she often sees on the seventh day. To him, she is a fellow student named Maria. Complications? Of course, but Silvana relishes them. She even creates them. 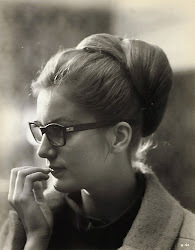 She dreams up a non-existent mother whom she is taking to the movies, and arranges for both her lovers to be there. She attaches herself to a woman in the theatre, enjoys the excitement, and then fabricates a tale about needing protection. When the men leave, she confesses! "Mother" comes in handy when the real Silvana's plane is reported missing and her grieving lovers think that she is lost. They discover each other at the airport and go to the Count's home to drown their misery and bitterness. They are drunkenly consoling each other when "mother" appears. She rails at them for not having prevented Silvana from flying, and they soon sob their forgiveness. Silvana follows up with a note, a recording, and a suicide threat. Her lovers find her in a gas-filled apartment, and how can they know that she has just taken off an oxygen mask? Competing in loving attention, they take her to the Count's country home. Who is to share the double-bed? Silvana resorts to the old envelope game, and gives each a blank sheet of paper. 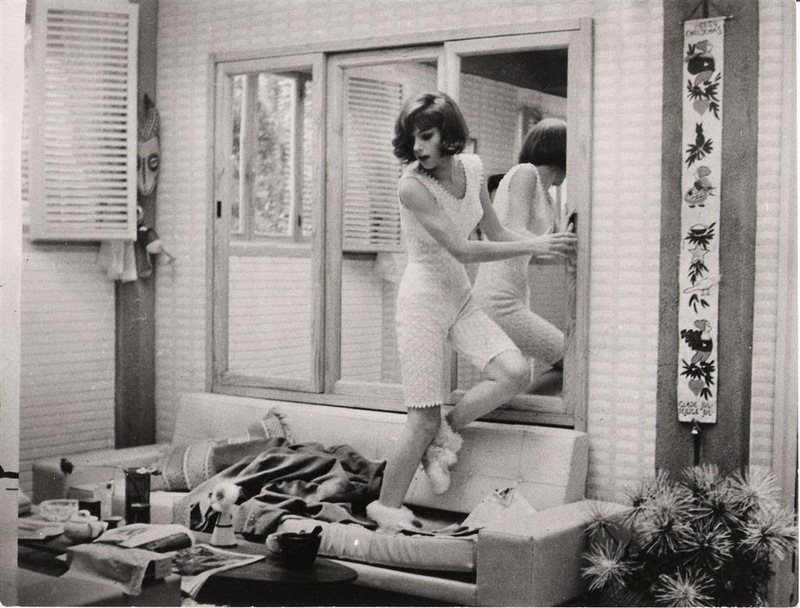 Overcome by jealousy, both men prowl, run into each other, and crash into the bedroom. Silvana is outraged! She was testing their love, and they have failed her. Arturo storms out! 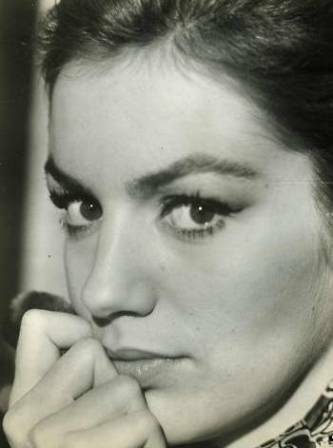 Silvana promises the Count that she will be his alone, and persuades him to keep their love secret so as not to hurt Arturo. 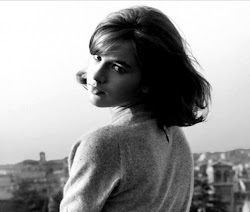 Then she convinces Arturo that he alone is to be the privileged one! 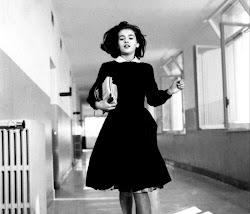 So it's all back to what Silvana considers normal, with love on the schedule six days a week. The student? 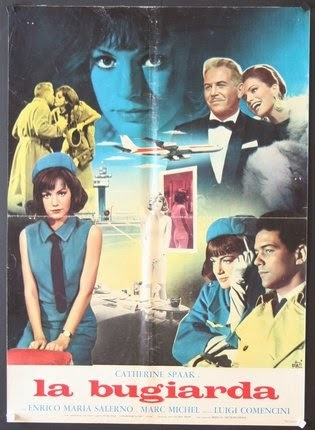 All he ever learns is that Silvana is really an airline hostess who will given him her one free day!" I like this film. 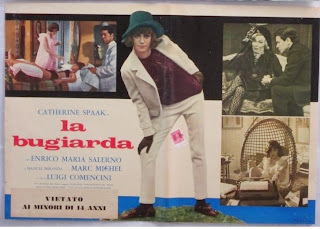 My favorite Italian comedies from the 1960's tend to be those that are based around what I think of as battle-of-the-sexes type humor, films like Il magnifico cornuto. It's the battle between chauvinistic Italian men and the women who, in reality, wield the true power that drives the humor. 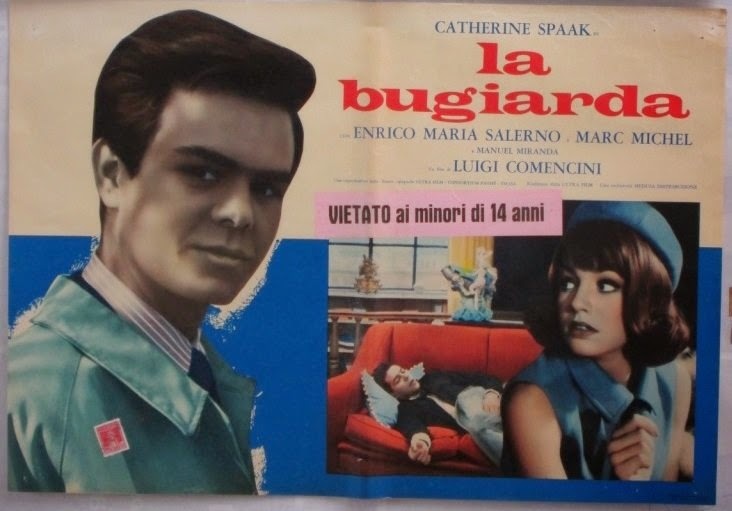 La bugiarda is that type of film, and I would classify it as "classic Spaak," a movie that should be on the must-see list for Catherine fans. Catherine is truly the star of the film, and she gets to show off her comedic talents. Don't get bogged down into believability or arty messages, just enjoy some good escapist movie fun. 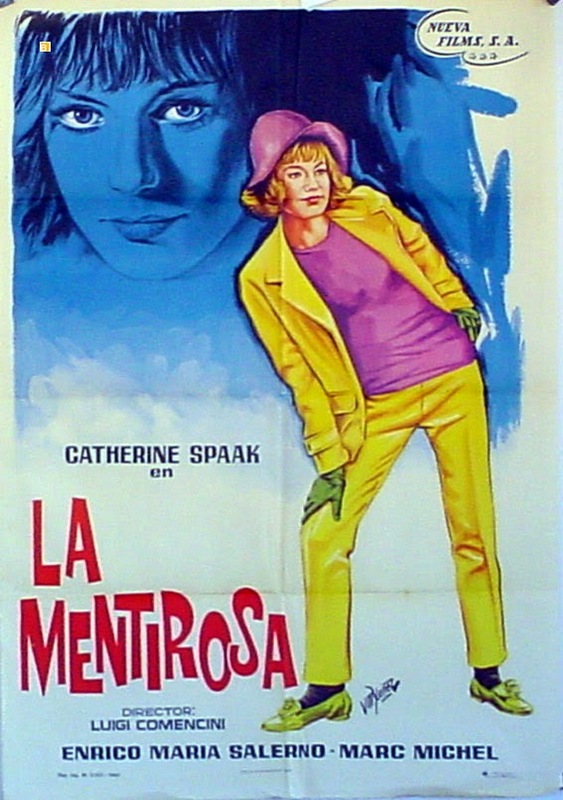 I particularly enjoyed two of the scenes described above in the synopsis, the scene where Catherine is confessing to the priest and the scene where she meets two of her suitors in a movie theater (each unknown to the other). 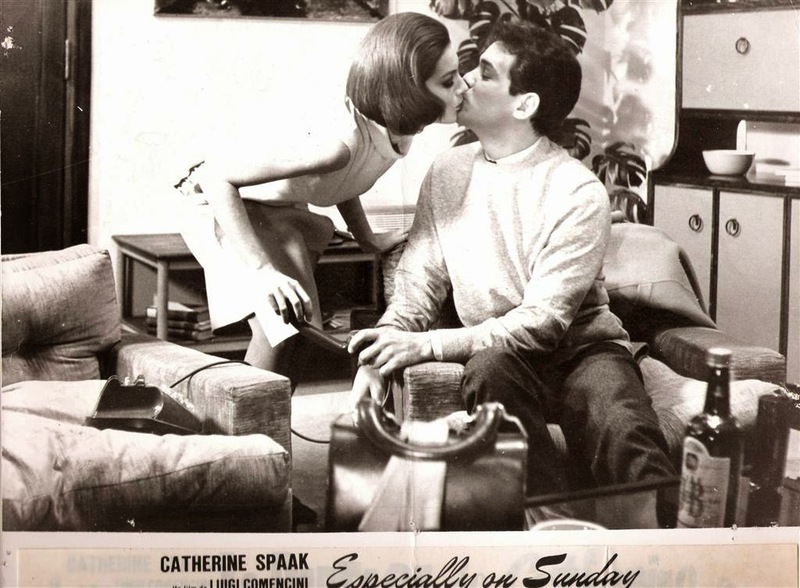 Those scenes are well-done, humorous, and Catherine performs well. In my mind, La bugiarda rounds out the over-all fantastic early part of Catherine's career. 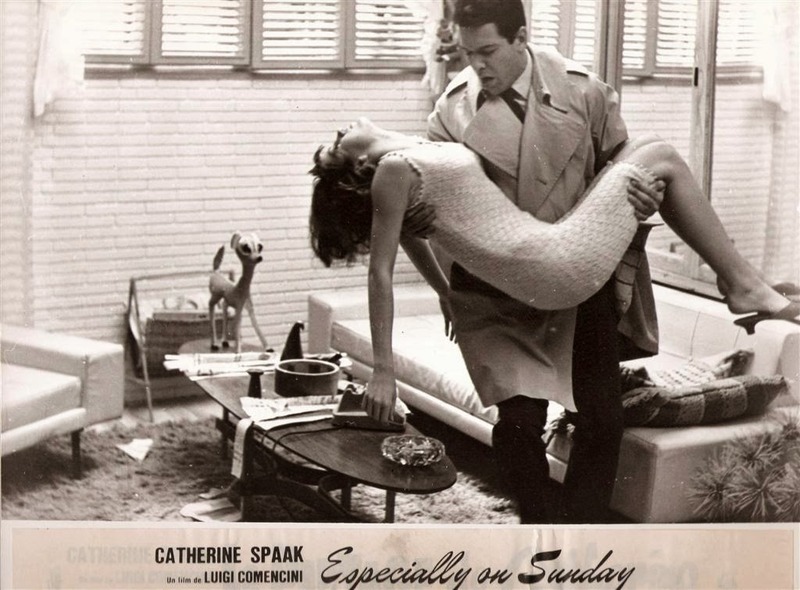 Although she portrays a young woman, rather than a teenager, per se, this was the last film made by Catherine before she turned 20, and the tone of the film fits nicely with her earlier work. 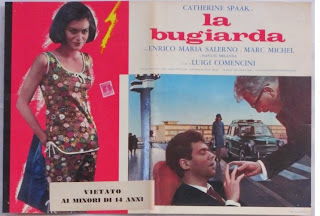 Catherine's film work from I dolci inganni in 1960 through La bugiarda in 1965, although containing a few misses, is a body of work for which any actress should be proud, and it established Catherine as a truly international movie star. 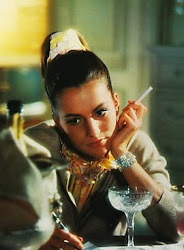 On a side-note, Catherine's roommate in the film (the real airline stewardess) is played by Janine Reynaud. 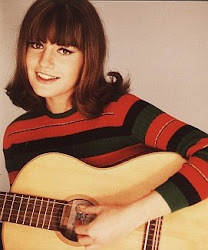 Janine would go on to gain a modicum of fame in several European sexploitation films of the late 1960's and early 1970's. La bugiarda was Catherine's first film project of 1965 (lensed in the Winter of 1965). 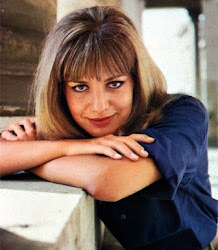 The July 15, 1964 issue of Variety reported from Rome that "Catherine Spaak to star for Ultra Film in Luigi Comencini picture, 'La Bugiarda' (The Liar), which Medusa releases." 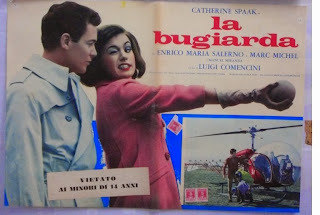 The March 26, 1965 Variety reported that Catherine had "recently wound production on La Bugiarda." 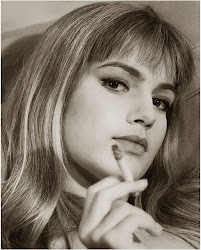 The June 30, 1965 Variety reported "Catherine Spaak to Paris to dub her latest, 'La Bugiarda' (The Liar)." 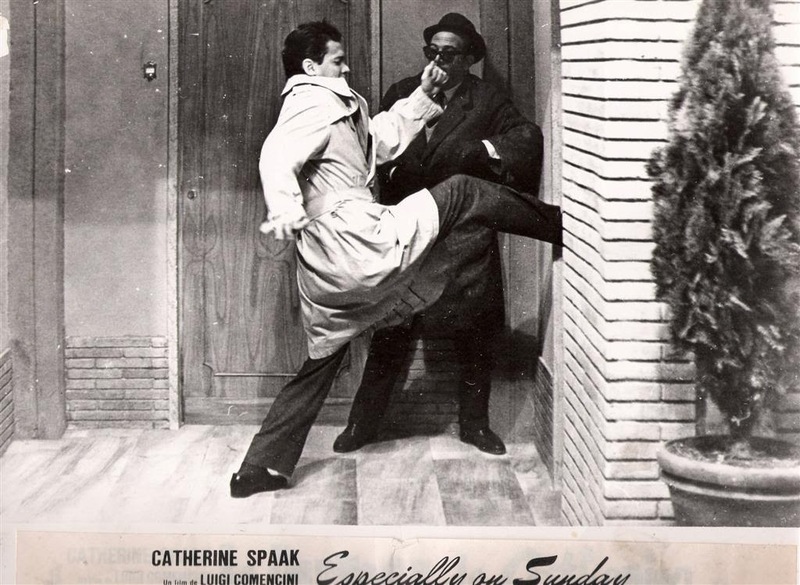 IMDB says that the film was released in Italy on March 22, 1965 (I presume that means Catherine's June dubbing work was for the French language version). 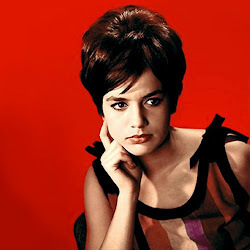 It also shows release dates for France (August 31, 1965), Spain (November 29, 1965), Finland (March 11, 1966), and Mexico (March 24, 1967). 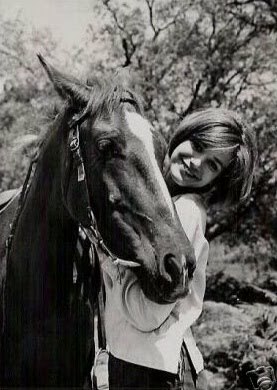 Under the title Six Days a Week, the film was released in the U.S. by National Showmanship Films Corp. (a subsidiary of Income Properties, Inc.) in 1969. 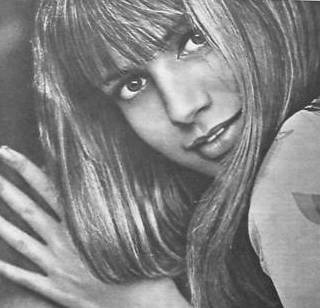 The November 27, 1968 Variety reported that the "[l]atest instant film company is National Showmanship Films Corp., releasing arm of National Showmanship, Inc. The latter, in turn, is one of several companies comprising Income Properties, Inc., publicly-held conglomerate. ... First acquisitions of Showmanship Corp. are ... the Italian 'Sei Giorni a Settemani' (Six Days a Week), directed by Luigi Comencini and featuring Catherine Spaak." As far as I can tell, the U.S. release was very limited, so I am probably fortunate to have found a copy of the pressbook. There is no mention of the film's release on any of the schedules in Boxoffice, and I have not been able to locate any U.S. press reviews for the film. 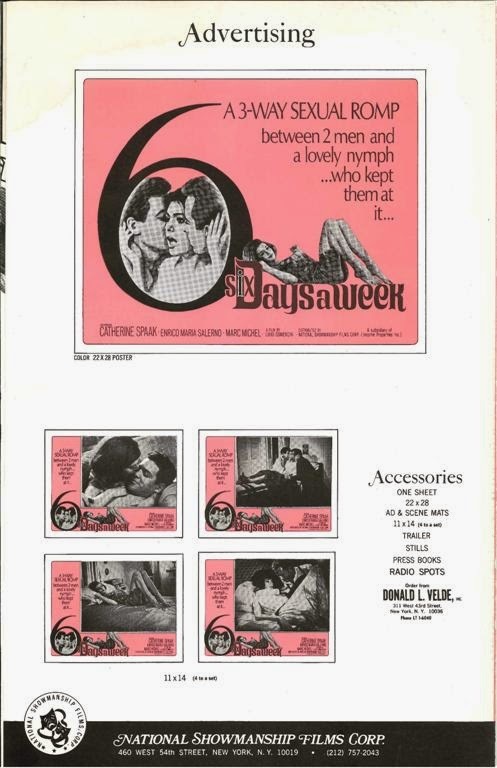 However, Variety reported grosses for the film (starting in the March 19, 1969 edition) for 3 weeks at two theaters in Philadelphia: the Bala (Week 1 - $4,100; Week 2 - $2,800; and Week 3 - $3,700) and the Yorktown (Week 1 - $3,800; Week 2 - $2,200; and Week 3 - $3,500). Those grosses were considered "quiet," "dull," "thin," and "slim." It seems safe to conclude that very few people in the U.S. saw this film, and I will be lucky to ever find any posters, lobby cards, or stills for the U.S. release. I have seen no indication of whether it was a dubbed or subtitled version. 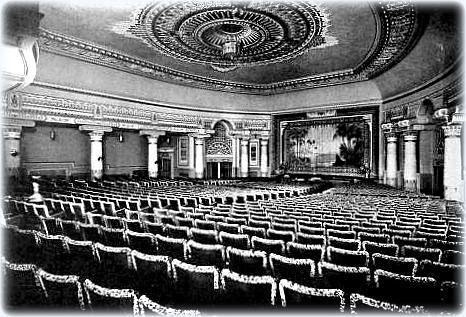 The Bala, a 1,450-seat theater with a balcony, opened in 1926 in Cynwyd, a suburb of Philadelphia. In the 1990's, it was converted to a tri-plex. 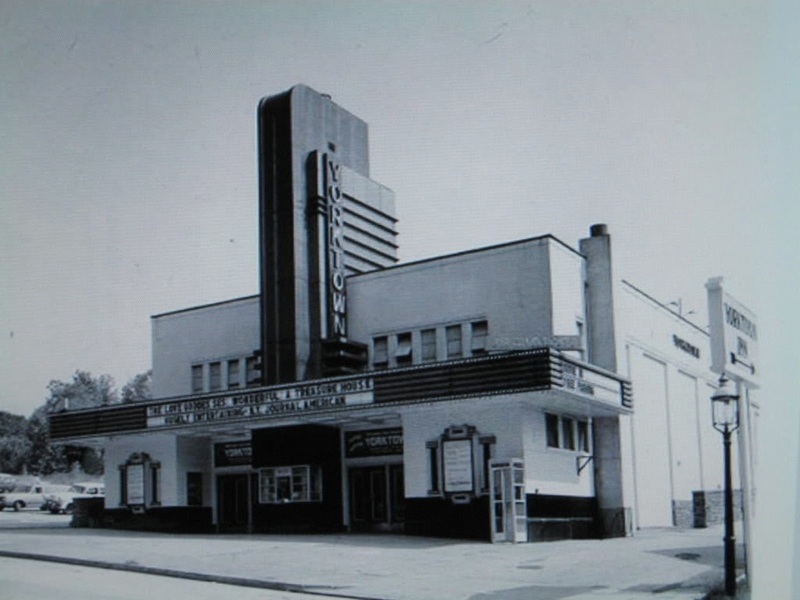 Here is a picture of the marquee, along with a picture of how the main floor of the auditorium looked in 1928. Here are some very interesting jumbo-sized stills. 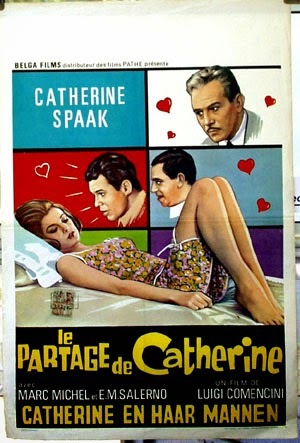 Originally, they had the French title "le Partage de Catherine" printed at the bottom, however, a new title "Especially on Sunday" has been taped over that title. 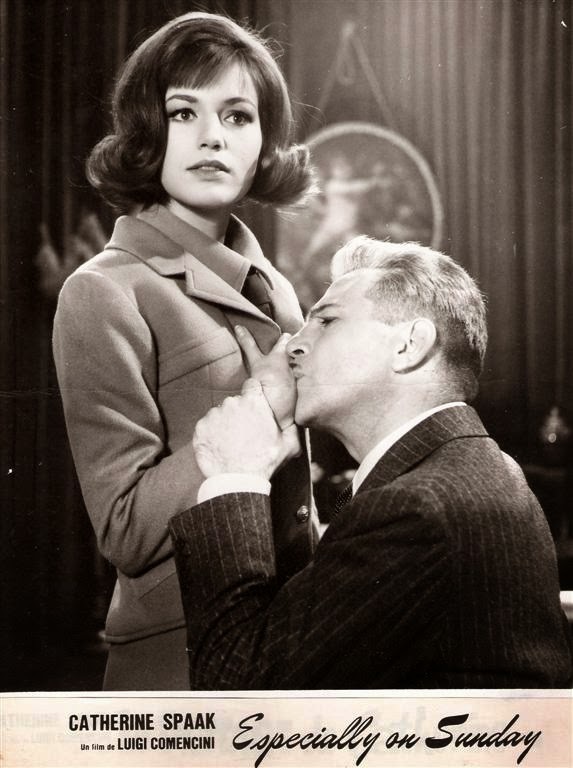 The stills came from Canada, so my theory is that such stills were used in conjunction with the film in French-speaking parts of Canada, but the new title was used in English-speaking parts of Canada. 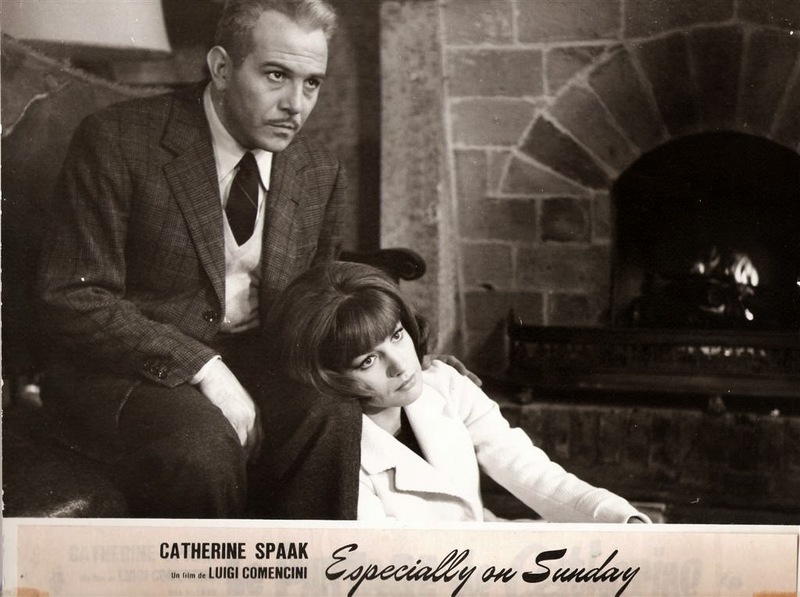 IMDB has no information indicating a title of "Especially on Sunday," and I have so far been unable to find any other information concerning such a release.